Much has been made of the revelation that Spotify has started to strike direct deals with artists — a move that its major label partners are understandably none too happy about. But just how much of a threat to the labels is Spotify’s experimental move towards licensing artists? The general consensus from the majors is that artists still need them, and their global marketing teams, to properly break worldwide. Distribution companies like Kobalt, BMG, Ditto and Empire – which don’t require artists to sign away their copyrights – will say this argument is fast becoming untrue, as streaming services enable a cheap and efficient global route to market. So cheap and efficient, in fact, that artists are now cutting out another layer out of the food chain and signing direct to retailers like Spotify, in deals which offer a relationship with a global distribution platform – and worldwide marketing might too. It’s been difficult to gauge just how successful these direct Spotify signings have been, with the streaming service remaining tight lipped about the deals. However, thanks to a report from Chartmetric, we now have an idea of how the careers of artists who are understood to have ‘possible’ direct deals with Spotify have played out so far. The report contains an important disclaimer: Even if any alleged Spotify direct deal is no longer current or never even existed, the DIY artists’ legal and creative status is still worth measuring against major-label acts. Chartmetric’s data compares five Spotify direct signings – all anonymized – with five major label artists. It tracks reach and engagement on Spotify, YouTube, Instagram, Facebook, SoundCloud and Twitter, as well as fans by region. The major label artists cited are Kali Uchis, Khalid, Charli XCX, Billie Eilish, and Halsey. Of the five DIY artists, genre is described as electronic-tinged with notes of indie pop, dance, and hip-hop; three are ex-US and two are from the US. While the major labels generally win on Spotify follower count and its popularity index, the numbers get particularly interesting when analysed by region. When it comes to Spotify monthly listener distribution, the DIY artists have a much more diverse fanbase. In August, the five ‘Spotify-signed’ independent artists combined had a near equal share of fans in Asia and Europe (34.2% and 31.1% respectively), followed by North America (24.3%), Latin America (7.6%) and Oceania (2.9%). On the other hand, the fanbase of the major label signings is predominantly based in the US, with North America taking the majority of listener distribution (63.9%) followed by Europe (25.3%), Asia (6.4%) and Latin America (4.4%). The result tallies with a recent report from global independent rights agency Merlin, which revealed that 42% percent of its members said that over half their digital revenues originate from consumption outside their home territory. In the space of three years (April 2015 compared with April 2018), revenues received by Merlin from Asian markets have increased almost eightfold. Over the same period, revenues received from Latin America have increased more than tenfold. When it comes to playlisting, major labels still have the lion’s share of opportunities on the biggest playlists Today’s Top Hits and Global Top 50, while New Music Friday is said to be much more open to the DIY artists. 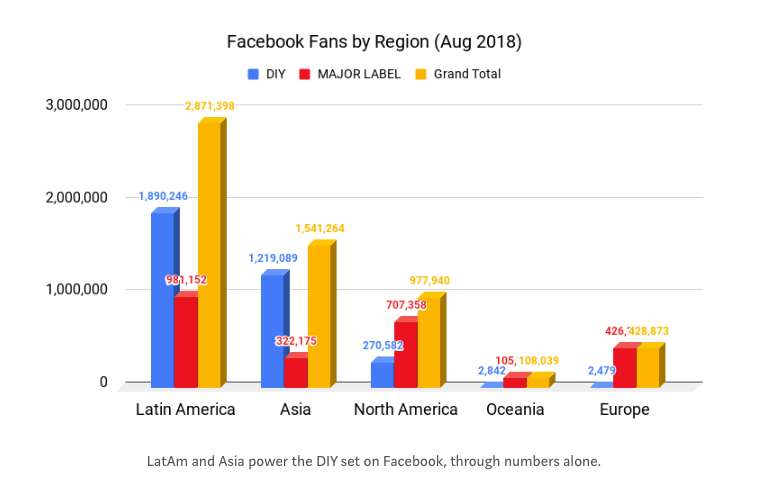 On Facebook, the DIY artists have nearly twice the amount of fans in Latin America than that of the major label artists (1.9m vs. 980k), and nearly four times the amount in Asia (1.2m vs. 322k). In North America, the major labels win with 2.5x as many Facebook fans (700k vs. 271k) and it’s a similar story in Europe (426k vs. 2.5k). When it comes to SoundCloud followers, the median of the majors is well over the DIY artists with over 188k fans, while DIY had a median of 14k. Another area where the major label artists win hands down is within TV/film sync licensing. Out of 65 tracks from Chartmetric’s Tunefind dataset, over 87% were from the major artists. In short, it seems that DIY artists are more likely to be able to earn revenue from all corners of the globe, while major label signings are, generally speaking, earning the majority of their income from local territories. That is likely to be due to the territory-centric corporate structure of the major labels encouraging local executives and staff to focus on domestic repertoire, as noted by Chartmetric.